Malaria is a disease that ravages not only those citizens who inhabit the countries it afflicts but also the many people who travel to such locals. Life and Death in the Age of Malaria is a simulation game currently in development at the University of Wisconsin's School of Nursing and is designed to especially help those traveling and working in areas of high risk for malaria. Members of the Age of Malaria team will demonstrate the latest version of their game, discuss the design decisions they've made, and solicit feedback for future versions of the game from all in attendance. The purpose of "Life and Death in the Age of Malaria" is to educate and encourage best practices for students traveling abroad to malaria endemic areas to reduce their risk of contracting malaria. "Malaria" is a turn-based strategy game. Within each turn the user will have a number of actions to use between an increasing number of on-screen characters. 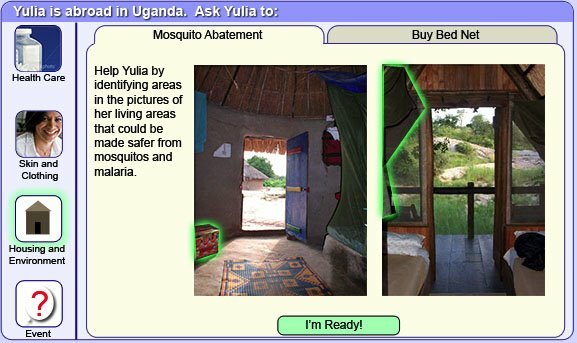 The main screen functions as a window into an imaginary world in which the player advises sim-students who are traveling abroad to malaria endemic countries. 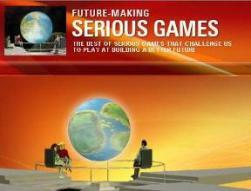 The game progresses through 16 weeks. The player is given a certain number of "actions" which are dependent on how many sim-students are on the map. 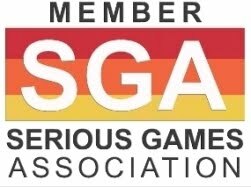 The player must manage the sim-students based on a limited number of actions and what he or she knows about the sim-student's history, risk-taking tendencies, and the country they are traveling to. 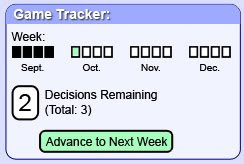 The game tracker panel is meant to give the student context as to where she or he is within the entire spectrum of the game and where he or she is within the current week. The student health panel provides an "at a glance" of how the player is doing both with regard to the health of the sim-students she or he is managing and the composite score. This is the space where the player assigns actions to active sim-students. The player can choose from three main action categories: "Health Care", "Skin and Clothing", and "Housing and Environment." Players may also be presented with an "Event" for one or more sim-students in any particular turn. If the currently selected sim-student has not been given an event, the "Event" button is greyed-out. The actions available to the player will vary depending on what phase of travel the activated sim-student is in. For instance, once a sim-student is abroad, and the player clicks "Health Care", one of the folder options is "Clinic". 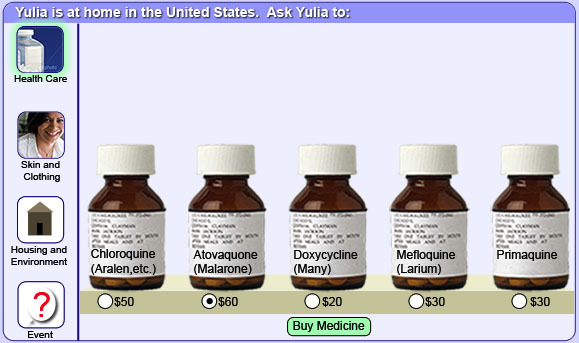 Clinic allows the player to purchase tests and treatments for the sim-student. This also allows a sim-student to be evacuated in case of serious illness if insurance was purchased in the Planning Phase. Consequences of an action are not revealed until a turn is over. Corrective feedback will then be available in 5 different ways: the sim-student Risk Meter and Decision History text and numeric notations in the Student Profile panel, and the Overall Risk Meter, Game Score, and icon indicators in the Healthy, Sick, and Deceased categories within the Student Health Panel. This corrective feedback only provides directional guidance for whether the player is choosing actions that provide risk reduction or not. Increased score means increased risk reduction and probability for keeping sim-students healthy. Explanatory feedback will be available within the decision-history at the end of each turn, and it will provide reasons for the action consequences on level of risk and the associated changes in game score.